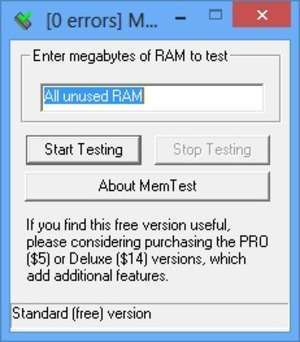 MemTest is a small utility which tests how fast and reliable your RAM is. If you're unfamiliar with what RAM is, it's the temporary memory that's used to store data by the programs you're currently using. Because of its real-time usage, it has to be fast and that's what MemTest tests. It's also useful to check whether the RAM you have installed is working properly, which is one of the best troubleshooting tools because of the importance of RAM. Version 6.1 is a freeware program which does not have restrictions and it's free so it doesn't cost anything. For security reasons, you should also check out the MemTest download at LO4D.com which includes virus and malware tests. Additional screenshots of this application download may be available, too. MemTest download been highly rated by our users.